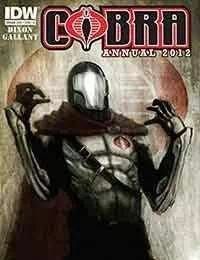 Now that the COBRA CIVIL WAR has ended, a new, more ruthless Cobra Commander has stepped into place. But how much do we really know about this new Commander? Theres only so much we can tell you! In this first-ever COBRA ANNUAL, Cobra Commanders origin is finally revealed! Once a [CLASSIFIED] in the [CLASSIFIED], the Commander led a [CLASSIFIED] and stole from [CLASSIFIED] and [CLASSIFIED]. Soon, this caught the attention of COBRA. A choice was given: join us or die. Little did High Command suspect that [CLASSIFIED] would one day become the newest leader of COBRA.